The SunTrust Prime Rewards Credit Card currently has an Informr score of 8.2 out of 10. This score is based on our evaluation of 3 sources including reviews from users and the web's most trusted critics. 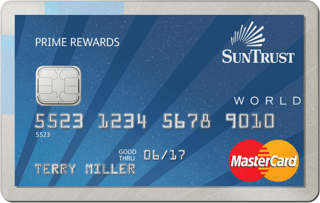 SunTrust Prime Rewards Credit Card is typically available to those with excellent credit scores (650 or greater). A solid balance transfer option for new cardholders seeking to pay down high-interest credit card balances without incurring balance transfer fees. For new cardholders who can afford to spend $500 within 3 months, it’s also an easy way to snag some extra cash. If you planning on doing any balance transfers soon, then check out the SunTrust Prime Rewards Credit Card. This card offers 3 years at an intro APR on balance transfers made in the first 60 days and no fees on balance transfers made in the first 60 days. Thanks to the low 5.25% intro APR, this option will save you the most if you know it’ll take you three full years to pay off your debt. But you’ll pay much more in interest on this card than on the Ring if you pay off your debt in less than three years. You can also lose the low intro rate if you miss a payment.